One morning I got breakfast from Bagel Talk Inc. in Elmont, NY. This little store is located in the back corner of a shopping center, right next to an Italian restaurant. Both stores seemed so small and close together that at first I thought they might be connected. Turned out they weren't. I had an egg and cheese sandwich on a sesame bagel. I was initially considering getting a bagel and cream cheese, but then decided that since the temperature outside was just pushing 30°F, I'd go with something warm. The freshly scrambled eggs did the trick. No complaints here. Just as the first snowflakes began to fall starting a big snowstorm, I picked up Chinese take out from Ah Law Kitchen in Elmont, NY. I was considering eating my food here, but their heater was broken. I was cold as I sat waiting for my food, watching the owner attempt to fix the heat, so I took the food back to a warmer location. I also had the shrimp with broccoli lunch special. It came with huge shrimp, plenty of broccoli, and carrots in a brown sauce. This came with a side of brown rice. The lunch was supposed to come with a wonton soup too, but they forgot to put it in the bag. By the time I noticed, I didn't feel like going back. I liked the food from Ah Law Kitchen, although I wasn't happy about not getting my soup! It was cold. The fountain in the park was covered in icicles. They had a huge ice skating rink in the park. Being that I was in New York at Christmastime in below freezing temperatures, I decided I had to rent some skates just for the experience. Didn't plan on skating for long, but I ended up being on the ice for about two hours! After skating, I wandered over to Rockefeller Center while looking for food. Rockefeller Center had a bigger tree, but Bryant Park's ice rink was better! I finally ended my night by buying a potato knish from a street vendor on the corner in front of Rockefeller Center. Earlier I went looking for the 53rd & 6th Halal Cart that I've read good things about, but they weren't there. So at midnight in the freezing weather, I decided to end my adventures with food for the night and settled on the knish to hold me over. I've had much better knishes in the past, but I wasn't expecting too much from a street vendor. It was tasty enough. I should have bought some chestnuts too! I've read plenty of good reviews of Anthony's Coal Fired Pizza in the Whole Foods Shopping Center in Orlando's Sand Turkey District. Anthony's slogan is "Pizza Well Done." When the waitress came over, she gave us a speech that broke down to "We burn our pizza. Warning you now so you won't send it back when the crust is black." It seemed like a funny gimmick to me, to specialize in burnt pizza, but I gave it a try anyway. The cheese pie was served, and the crust was indeed black around the edges. I gave it a try, and it was a really tasty pizza. The crust was thin and didn't really have the burnt taste I was expecting, the coal oven actually gave it a really nice flavor. I did find it a bit strange having black hands from all of the charcoal after picking up the slice, but I guess that's part of the novelty of coal oven pizza. The cheese wasn't overloaded, the pie had a good amount of the salty mozzarella. The sauce was slightly spicy and really tasty. Anthony's makes little pools of their sauce rather than spreading it evenly around the whole pizza. I guess this makes the pizza look more gourmet, but I know a few people that have issues with pies like this. I personally don't mind the sauce puddles, as long as the sauce tastes good. I ate at Tailgaters Smokehouse in the shopping area surrounding the UCF Arena in Orlando. Tailgators is a sports bar, and the as my meal progressed, the restaurant fit perfectly into the stereotype of sports bars having bad food. But it wasn't just the food, service was bad here too. 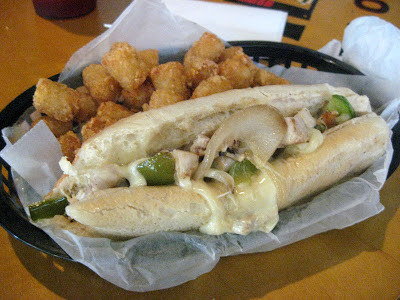 I ordered a Chicken Cheesesteak sandwich, served with tater tots. After a very long wait with a very inattentive waitress, our food was finally served. The sandwich was a bit smaller than I was expecting and was very bland. Couldn't taste any seasoning whatsoever on the chicken and the bread reminded me a bit too much of a hot dog roll than what cheesesteaks are normally served on. I did like the tater tots though. Moral of the story: Avoid the chicken from Tailgaters. I ate at the Hamburger Mary's on Church Street in Downtown Orlando. The restaurant is one of the few open businesses in the sad and mostly abandoned shell of the former tourist district known as Church Street Station. Besides from Amura, it seems most restaurants in this area of downtown don't last very long when they open (or reopen for a second time), so I wonder how long Hamburger Mary's is going to hold out. The meal started with an order of Mary-Mac & Cheese Balls. Deep fried macaroni and cheese is just wrong in my opinion. To me, these should be relegated to the disgusting carny food at the fair. Pasta is definitely not meant to be breaded and deep fried. I had a Bird of Paradise sandwich. It consisted of turkey, bacon, avocado, tomato, cheese, and mayonnaise on wheat bread. I was initially surprised to see that the sandwich had actual roasted turkey rather than the normal sliced cold-cut deli turkey that restaurants normally serve on sandwiches. It was a very tasty sandwich, served with a side of fries. I've known of Clock Family Restaurants for years, but I had never eaten in one. One day while in Auburndale, FL, I finally got to try a Clock. I happened to be looking through a coupon book and found some coupons for a place called The Taco Maker. I had never heard of them, but I took the coupons just in case I ever came across The Taco Maker. Later that day, I was in Davenport, FL in the strip mall that sits on the former site of the Circus World and Boardwalk & Baseball amusement parks. As luck would have it, I spotted The Taco Maker hidden away at the end of the mall and decided to stop. I got out my coupon for "Free Crustos," not having a clue to what Crustos were and entered the restaurant. It turned out that Crustos were fried tortillas covered with cinnamon and sugar. They seemed very similar to Taco Bell's Cinnamon Twists. They were okay for what they were, but Crustos were not a dessert I would purchase in the future if I didn't have a free coupon. I ate a lemon sorbet waffle cone from the Kilwin's in Celebration, FL. I have no complaints. Simple ice cream like this is so much better than what you get from all the Cold Stones and Marble Slabs where you get a half melted mass of ice cream by the time they mix in your toppings. I had dinner at Happy Teriyaki in Longwood, FL. This place has been here for a really long time, as long as I have lived in the area. They never seem busy, but must be doing something right to still be around after all this time. Their menu is mostly Japanese/Sushi with some Chinese items mixed in. I had a bowl of Udon Soup. This huge bowl of soup came filled with chicken, shrimp, fish cakes, a fried egg, assorted vegetables, and udon noodles, all in a clear broth. It was really tasty and was way too much food! The egg was a bit too runny for my liking, but otherwise I had no complaints! I had a pulled pork burrito from Qdoba in the UCF Student Union. I've had pork tacos before, but never a pork burrito, and never from a big chain. The burrito was stuffed with pulled pork, peppers, onions, black beans, rice, salsa, sour cream, and cheese. The pork did taste okay, but I don't think I would order it again. Too much meat in a restaurant where my favorite menu item is the vegetarian burrito. The lack of guacamole is what really killed the burrito for me, but it wasn't worth $1.50 in my opinion to have a little scoop of mashed avocado added. On a Saturday afternoon, I did some exploring of Downtown Miami. After checking out some museums, street fairs, and some very cool mass-transit systems, I was starting to get hungry. I decided to get my lunch from a restaurant called Iron Sushi. Iron Sushi is a take out Japanese restaurant that seems to do a lot of delivery business to the surrounding office buildings. The restaurant itself was tiny, with a few places to sit inside as well as several outdoor tables on the sidewalk. I started out with some miso soup. Iron Sushi was very generous with the amount of tofu and seaweed in the soup, and that's a good thing! Next, I had a California Roll made with brown rice. Sometimes I have found brown rice sushi falls apart much easier than the standard white sushi rice, but this wasn't the case here. The rolls were very solid with no crumbling, filled with krab, avocado, cucumber, and topped with masago. 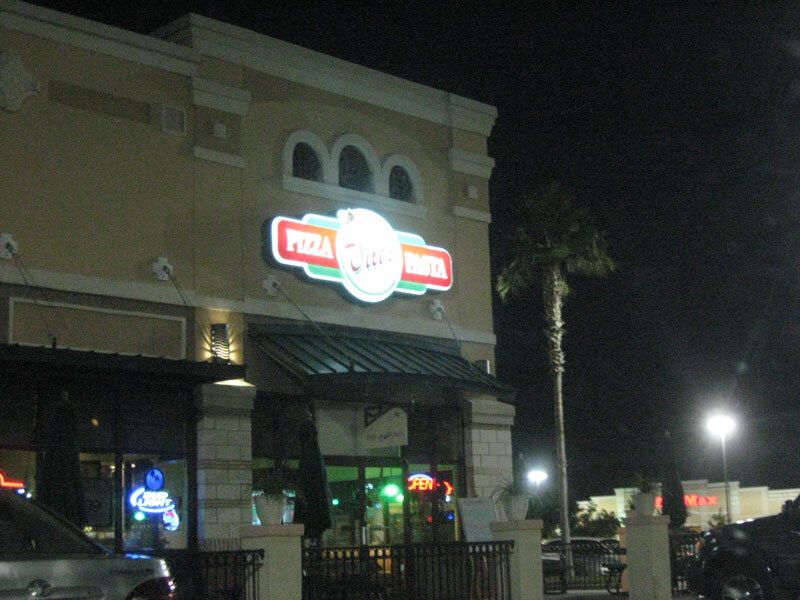 I ate at Vito's Pizza & Pasta in the Waterford Lakes shopping center in Orlando. This restaurant seemed to be a former Papa Joe's, and the food was very similar. 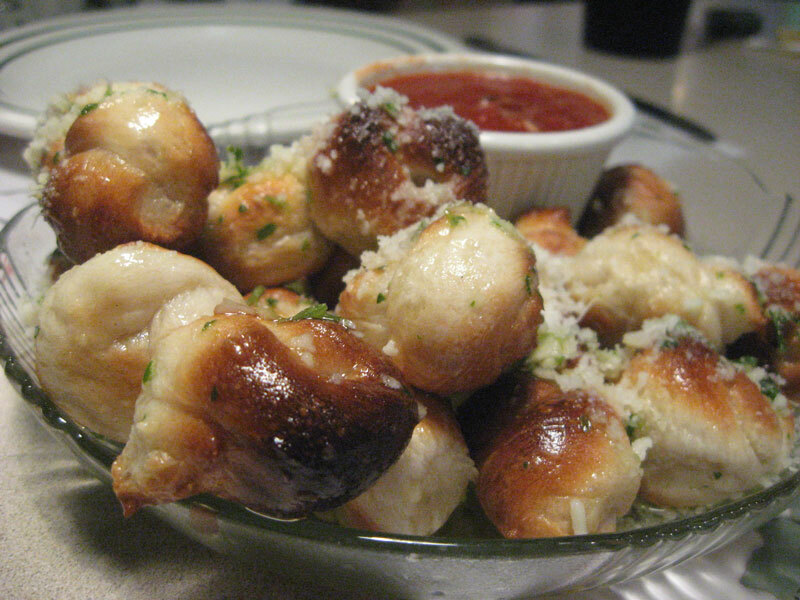 The meal was started with an order of garlic knots. 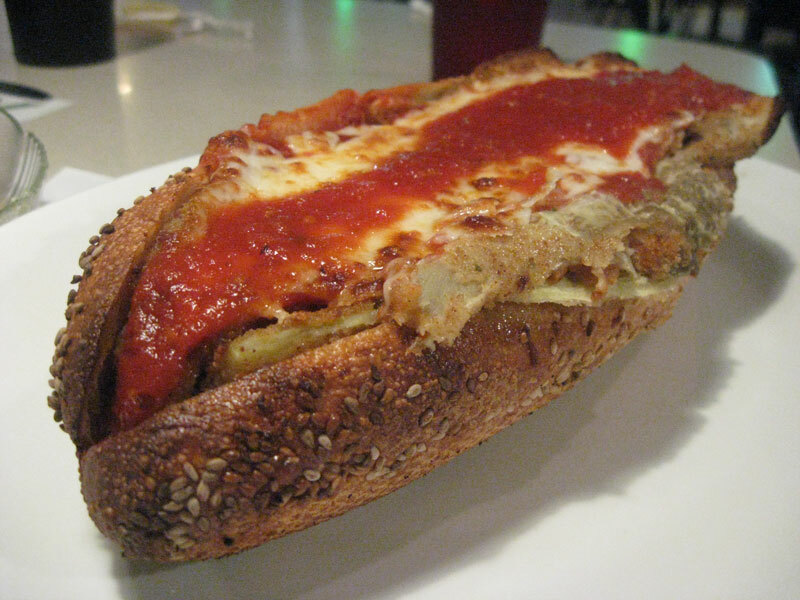 I ordered an eggplant parmesan sub. As far as sandwiches in Italian restaurants go, this one was huge. Normally, I have no problem finishing my food, but here I had to leave almost half of the sandwich. It was really overstuffed with breaded eggplant, tomato sauce, and melted cheese. The bread was nice and crusty, covered with sesame seeds. Vito's left me with no complaints about their food! The very second post here on Watch Me Eat consisted of my thoughts on a Chick-fil-a Chicken Sandwich. Since then, a few people have posted comments and I've received several emails of people pointing out how to improve this sandwich or what I should order at Chick-fil-a instead. I received a coupon for another free Chick-fil-a Chicken Sandwich, so I decided to give them another try. I went to the Chick-fil-a Express at UCF and this time got some sauces to go with the sandwich. Adding sauces to the somewhat dry fried chicken on a bun with a pickle was somewhat of an improvement, but the sandwich still does nothing for me. If it wasn't free, I definitely would be ordering something else from Chick-fil-a. I've been told the grilled chicken sandwich is a whole lot better than this. Still, I really don't get the appeal of Chick-fil-a. It seems every Chick-fil-a I pass is always crowded, but I have tried nothing there that I like. Except for their waffle fries. Chick-fil-a does make good waffle fries.